Pfister and Vogel operated in some form or another until the year 2000. Published Jan. 31, 2019 at 11:06 a.m. This series originally ran in April 2016 for Milwaukee Day, but in honor of Milwaukee's birthday, we're re-running it to highlight the 21 people, moments and ideas that have defined Milwaukee and continue to shape the city. This is part 2 of 4. Happy birthday, MKE! Read Part 1. To say that the story of Milwaukee's immigrants is a melting put isn't giving it enough credit. Of course, the earliest settlers were native Americans, while the French first found Milwaukee in 1674. As for the the 1800s, yes, the obvious stories are ones of German and Polish arrivals, but that only scratches the surface of Milwaukee's ethnic makeup. Indeed, Germans first came here in 1839 and were a majority of the population by 1860, but Poles grew to 60,000 in Brew City by 1900 – second in size to the Germans. The first African Americans set down roots in 1835, working with Solomon Juneau. Between 1900s and the 1950s, particularly after World War II, the black population grew by nearly 2200% thanks to the availability of domestic and arduous industrial work. They now make up almost 40 percent of the city's population. In 1860, Irish immigrants comprised 15 percent of Milwaukee's residents, settling primary in the Third Ward to work jobs on the water and rail yards. Bay View became home to Italians in 1890s, while the Latinos – predominantly Puerto Ricans and Mexicans – began settling in Milwaukee's South Side neighborhoods via recruitment from Pfister and Vogel, in the early 1900s. The tannery had hired the Latinos as strikebreakers for a labor dispute. In the meantime, Eastern European Jews found themselves on the north and west sides, and more recently, Hmong residents came to Milwaukee seeking asylum during and after the Vietnam War. Today Milwaukee celebrates its melting pot heritage every summer with an intense variety of ethnic summer festivals, from German Fest to Mexican Fiesta, Irish Fest, Bastille Days, Junteenth Day and more. After spending well over half a century as a U.S. territorial possession, Wisconsin – thanks to its growing fur, lumber, diary and mining industries – grew enough of a population to apply for statehood. So, in 1846, Wisconsin began the official process, confirming their decision with a territorial legislature vote and getting to work on a state constitution. Two years and one tossed-away constitution draft later, on May 29, 1848, Wisconsin became the 30th state – as well as the last one fully east of the Mississippi – entered into the Union. It was during this in period between its status as a territory and its official statehood that Wisconsin earned its nickname as the Badger State – and no, not because a disproportionate number of the fuzzy, future garbage can raiders called the area home. The "badger" nickname actually comes from the state's early miners, who, rather than wasting time, effort and supplies creating homes and structures, instead lived in the very holes they'd burrowed into the land. So really, the Wisconsin Badgers' logo should be less adorable furry rodent and more buff, dirty miner. By 1860, Milwaukee's population had more than quadrupled. Many of its inhabitants were Germans, who had fled their homeland following the Revolution of 1848. With them, they brought a culture of beer halls and beer gardens, along with generations of brewing know-how. In fact, by 1856, there were already more than two dozen breweries in Milwaukee, most owned and operated by immigrants of German descent. Among them, Frederick Miller, Joseph Schlitz, Frederick Pabst and Valentin Blatz would ultimately make names for themselves as owners of "The Big Four" Breweries: Miller, Schitz, Pabst and Blatz. Growth happened quickly for the industry, which went from producing about 225 barrels in 1851 to over 2 million by 1892, making Milwaukee the third largest producer of beer in the U.S. And clever marketing tactics only added to the brewing frenzy. In 1882, for example, Pabst began tying blue ribbons around its beer bottles -- just one of a slew of promotional efforts that assisted them in increasing their production from 100,000 barrels per year in 1872 to 1 million barrels in 1895. By 1874, the brewery was the nation's largest. And, by the mid-1960s,"The Big Four" were among the top ten breweries in the world. As late as 1981, Milwaukee had the greatest brewing capacity in the world. But, as the big names like Schlitz shuttered, and Blatz became no more than a name on a can, large scale brewing has taken a turn in the "Brewery Capital of the World." Today, MillerCoors stands as the one remaining brewery left among the giants. Fortunately, thanks to the ingenuity of and widespread determination to preserve the history of brewing in the city, Milwaukee is seeing a Rennaissance in brewing -- from a growth in home brewers and micro-breweries to the expansion of local craft brands including Lakefront Brewery, Milwaukee Brewing Company and Sprecher Brewing. Even in its earliest days, Wisconsin was a progressive-leaning state. The first draft of its state constitution, while eventually voted down, gave married women the right to own property and made the issue of African Americans' right to vote open to popular vote. Shortly after receiving its statehood, Wisconsin was also the home of several abolitionist groups and underground railroad stop-overs. One of the young state's earliest and biggest progressive victories came in the form of Joshua Glover's rescue. The fugitive enslaved African escaped St. Louis in 1852 and ventured up to Racine hoping for asylum, but two years later, his former slave owner found out his whereabouts and tried to use the Fugitive Slave Act to have him returned to his possession. While imprisoned in Milwaukee, however, a mob broke Glover out of jail and put him on a steamer toward freedom in Canada. When those who aided in Glover's escape were put on trial, the Wisconsin Supreme Court stepped in and ruled the Fugitive Slave Act unconstitutional, a significant step forward in the fight for abolition. The original Milwaukee courthouse and jail where Glover was imprisoned and eventually broken free from no longer stands, but there is a historical marker where they once stood: right in Cathedral Square Park. The effects of Milwaukee's own Christopher Latham Sholes can be felt across the whole world due to his creation of the first commercially successful "literary piano," aka the typewriter, in 1868 and, perhaps more significantly, the QWERTY keyboard layout in 1873. QWERTY, named for the first 6 letters on the top row of the keyboard, is still the primary layout in use today. 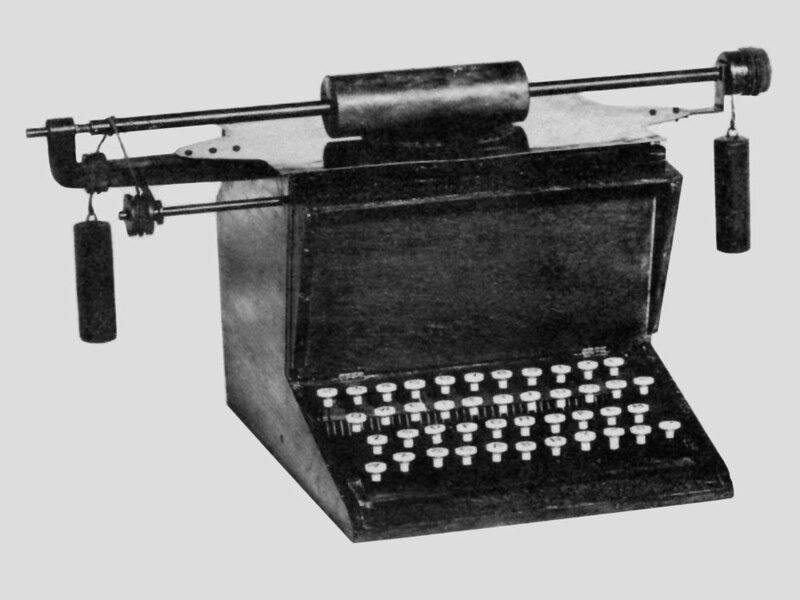 Christopher Latham Sholes' QWERTY typewriter was developed in 1873. But with the golden age of mobile devices and onscreen keyboards upon us, developers are no longer satisfied with the 150 year old layout and experimentation with typing, tapping and swiping styles is back on the rise. The Milwaukee Public Museum holds onto a collection of 876 vintage typewriters, however only one of them is on display. Around that same time, Milwaukee became known for its meatpacking. As a side effect, it also became home to many tanneries, which sprung up along the Milwaukee river. In 1890 the city became the world's largest provider of tanned leather. Today, due to the toxicity and decay of the buildings and the surrounding land, most of the industrial buildings that lined the Milwaukee river have been torn down, replaced by luxury condos and apartments. And with plans to build the new Milwaukee Bucks stadium nearby, the makeup of the area around the river will likely continue to change. 1901 saw the inauspicious creation of a motorized bicycle whose engine was so weak it couldn't even surmount Milwaukee's modest hills. As a result, pedal assistance was necessary. That didn't stop William S. Harley and the two Davidson brothers, Arthur and Walter, from trying again. Two years later, after a bit more experimentation, Harley-Davidson was founded and eventually became the world's largest motorcycle manufacturer. It continues to operate within the city. While industry jobs are no longer what they used to be due to automation and outsourcing, the city's industrial past continues to provide jobs today via companies like Rexnord, Briggs and Stratton, Harley Davidson, Master Lock and Allen Bradley-Rockwell Automation.